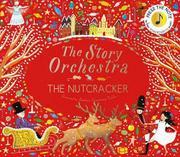 This lavishly illustrated interpretation of The Nutcracker includes embedded chips that play short excerpts from Tchaikovsky’s music for the ballet. The plot of the beloved ballet is retold in 10 double-page spreads, with a button that triggers an audio clip integrated into each spread. The story opens with the Christmas party at Clara’s house, with a multicultural crowd of guests in old-fashioned party clothes. The familiar tale unfolds with the battle between the toy soldiers and mice, the journey to the Land of Sweets, and the return to reality with Clara asleep under the Christmas tree. The text blocks are skillfully integrated into the illustrations, with borders of candies, flowers, or branches surrounding the words. Vibrant, detailed illustrations are filled with magical trees, fantasy flowers, and opulent backgrounds for the different dances. Every scene includes dancers of multiple ethnicities, including a Sugar Plum Fairy with brown skin. Clara and the other main characters are white. The final pages include a biographical note about Tchaikovsky, a glossary of musical and ballet terms, and buttons for all 10 musical chips along with explanations of the relevance of each selection to the story. The recordings are brief and of notably high quality for the format. Adults preparing children for attending a performance of the ballet will find this edition helpful in explaining both the plot of the ballet and Tchaikovsky’s music.